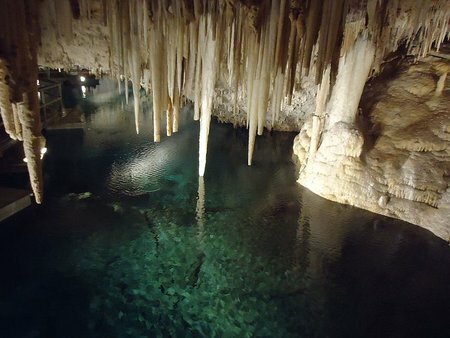 Located in Hamilton Parish Bermuda, Crystal Caves is one of the largest and famous caves in the island. It is about 36 meters (120 feet) below the ground level. 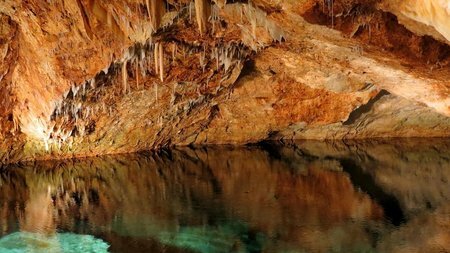 With its dramatic formations of stalactites and stalagmites which are crystal-like pointed structures naturally formed out of limestone rocks, the view of the sight is just awesome. There is a lake called the Cahow Lake within the caves complex and it has crystal clear water. You can walk over a pontoon bridge that goes across the lake. The lake has a depth of 17 meters (55 feet). As you walk over the bridge and look up, you will see stalactites dripping from the ceiling. If you look down through the perfectly clear water, you see stalagmites rising from the cave floor. Crystal cave was discovered in 1907 when two young boys were attempting to retrieve a lost ball. They saw the ball dropping into a large hole. As one of them went deeper and deeper into the hole to fetch the ball, he realized that it wasn't an ordinary hole. It was leading to some wondrous cave. The owner of the property Mr. Wilkinson was immediately informed. He then used a rope and lowered his 14-year old son through the hole. At a depth of about 120-ft and using a bicycle lamp, his son for the first time saw the wonder of the caves. The hole through which the boys entered is still visible. But you don’t need to now squeeze yourself through the hole to enter the Crystal Caves. A separate entrance has been created. Close to the Crystal Cave is Fantasy Cave located within the same complex and is a natural wonder. This was initially opened as a show cave in 1914 and was closed down during the World War-II. It was later re-opened. At Fantasy caves, the climb down is quite steep and therefore climbing up can be a little tiring. The guided tour for Crystal and Fantasy Cave begins with a walk through the park within the property. There is an assembly point (or common area in the park) from where the tour starts. As you walk through the park, you can see many indigenous plantations of Bermuda. Fantasy Cave is a virtual jewel box filled with formations from top to bottom. You can see the rare chandelier like cluster of soda straw formations at the ceilings. Entire walls are covered with calcite mineral deposits that look like frozen waterfalls. It takes about 30 minutes to see one cave and 75 minutes if you plan to cover both Crystal and Fantasy caves. You can take a guided tour in the caves complex. The guides are quite knowledgeable and will give you lots of information about the caves, its history and the formations. There is a small gift shop at the Crystal Caves location called Fiddlestix. It sells small souvenirs and gifts. There is also a nice cafe called Cafe Olé located at the entry having shaded tables as well as open air sitting on a patio. They serve breakfast, lunch, snacks and afternoon tea. They make daily lunch specials. Try out the Wahoo burger, fish sandwich, ribeye sandwich or some salads. They also serve traditional Bermuda codfish breakfast. For lunch you can also go for Bermuda's oldest and famous pub Swizzle Inn which is located nearby (2-3 minute walk from the main entrance of the caves or the bus stop), although they serve mainly pub fares during lunch time. There is one side of the Crystal Caves which the tourists never get to see. Far below the waters and under the boardwalk, there is a spectacular amphitheater that has been discovered by an elite set of divers in 2011 (see the picture below). The divers have found two giant pillars under the water and also a giant manta ray which is a rare sight in Bermuda's waters. 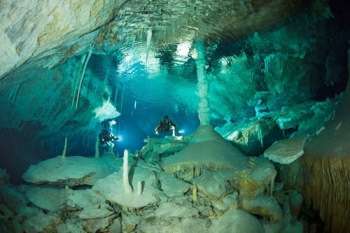 They have also identified a deep cut on the reef face some 370 feet below the water surface indicating where the sea level was some thousands of years back during Ice age. $22 for each cave for adults, $10 for children between 5-12, under 5 free. Combination ticket to both Crystal and Fantasy Caves is $30 for adults, and $12 for children between 5-12. Credit cards are accepted. Advance booking is not required. You can simply walk in. Both Crystal caves and Fantasy caves are open daily from 9am - 5pm. Last combination guided tour is at 4:30pm. The guided tour takes place every 20 minutes (tour cost included in admission fee). 8, Crystal Caves Road, off Wilkinson Avenue, Bailey's Bay, Hamilton Parish, Bermuda. Go to Bermuda Tourist Map to view the location of the caves and other attractions nearby. Bus Routes: Buses #1, 3 (between Hamilton City and St George's) go via Crystal & Fantasy caves (actually the bus stop is on Wilkinson Avenue. Tree shaded Crystal Caves road starts next to the bus stop, and leads to the caves complex. Caves are also accessible from bus routes 10 and 11 (you need to get off at Blue Hole Hill circle next to Bailey's Bay Ice cream parlor across Swizzle Inn and walk for 2 minutes to the Wilkinson Avenue bus stop). Note that it requires 3-4 minute walk from Wilkinson Avenue bus stop to reach up to the caves complex. There is also some walk involved within the complex. There are scooter and car parking inside. To reach the caves from the dockyard (Kings Wharf), take the Blue Route ferry to Hamilton City (20 minutes), and take bus #1 or 3 for the caves (25-30 minutes). This is the easiest way to reach the caves from the dockyard. The bus stop an approach road leads to the caves through a parkland. Alternatively you can also take bus #7 or 8 to Hamilton (takes nearly one hour from dockyard ) and then transfer to #1 or 3. You can also get taxis from Dockyard taxi stand. Takes about 45 minutes by taxi to reach the caves from dockyard. On your return, you may not get a taxi unless you see one getting released by other visitors. If you have a transport pass then you won't need to pay any separate public bus or ferry fares. Otherwise, from dockyard up to Hamilton City, fare by token is $4.50 and by cash $5.00 per adult in both bus and ferry. From Hamilton, the bus fare up to caves is $4.50 by token and $5.00 by cash. However if you come by bus up to Hamilton and take the next bus connection for the caves, then no additional fare is required for the second part of the travel (collect the transfer slip from the first bus). 2) Check out Bermuda Caves to know about the other great caves in Bermuda. 4) Check out Hamilton Parish to know about other great attractions in the parish. Hi Raj, I am looking to travel from Tobacco Bay Beach to the Crystal Caves. What bus number should I be looking to take and is there a bus stop near the Beach? Thank you for your help! I love your website. Hi, there is only a private minibus service at Tobacco bay which can get you up to Kings Square in St. George. You can then take bus #1 or 3 for Crystal cave. Hi Raj, I was hoping you could let me know which beach is closest to crystal cave as we would like to fit in as much as possible into one day. Also can you suggest a mode of transportation from shipyard. Thank you. Hi, John Smith's Bay in Smith's Parish (2.8 miles, bus #1 and 3 from Crystal Cave) and Shelly Bay Beach at Hamilton Parish (2.7 miles, bus #10, 11 from Crystal cave) would be the nearest ones to the caves. From the dockyard you can get to the caves by first taking a ferry to Hamilton City and then bus #1 or 3 (note that John Smiths bay beach will be along the way, so you may like to visit the beach first an then get to the caves). I am hoping you can help provide me some information regarding visiting your crystal caves. In August I will be visiting the island via a cruise to Kings Wharf. Can you please help provide me the quickest way to the caves from the port. What would the cost for the transportation there be? I am extremely nervous in timing and missing the cruise departure time, we are supposed to arrive at the pier at 8am and depart at 4pm. Will there enough travel time to and from the pier and time at the caves? Thank you for any help you can provide me. Take a ferry from the dockyard to Hamilton and then a bus (#1 or 3) to the caves and same way back. Yes there will be enough time to visit. If you pay the transport fares in cash, then for each journey by ferry or bus, it will cost $5 per person ($4.50 if you pay by token). So in cash... it will cost a total of $20 per person to go and come back. I am so looking forward to seeing the caves in just 2 weeks! One more question for you all- how often do buses come by for the return trip from the caves? We hope to take the bus back as well, but I am concerned if we will be waiting a long while on a Monday afternoon for a bus to come by. Read lots of info on how to get there, but not much on how to get back! How frequently do these public buses go by? Both bus #1 and 3 operate every 30 minutes on weekdays. With about 10-minute gap between their schedules, you can expect a bus every 20 minutes to get back to Hamilton from Crystal caves. However to get to St. George from Caves, the gap would be more (30 minute+) because some of these bus services terminate at Grotto Bay and do not go all the way up to St. George. It's better to take a short walk to Blue Hole Hill bus stop and take bus #10 or 11 ... you can expect to get a bus every 15 minutes to St. George or Hamilton. Hi, If I rent a scooter at the dockyard how long will it take to get to the caves? Also which road would be the quickest way to get there south road or middle road? Thank you! Hi, dockyard to Crystal Caves is about 20 miles and will take around 1 hour 10 minutes to reach by scooter in normal traffic. Take the Middle road which will eventually meet with South Road, then Knapton Hill, then to Harrington Sound Road and finally to Wilkinson Avenue. My family will be visiting Bermuda in a few weeks and taking a mini van guided tour of the island. We want to take the kids to visit Crystal Caves but I am concerned my elderly parents will not be able to make it down and up the stairs for the caves. You mentioned a cafe and gift shop. Can they wait inside for us and do we have to pay a $22 entrance fee for them as well? Thank you. Hi, your parents can wait at Cafe Ole. The cafe is right at the car park before the entrance to the cave complex and there are plenty of seating area there... both outdoor and under shades. They don't need to but the entrance tickets to the caves. How long does it take by bus/ferry from Royal Dockyard to Crystal Caves thank you. We are so excited to visit this beautiful island, I have not been there since 1980! Take ferry from dockyard to Hamilton (20 minutes), then bus (#1, 3) to Crystal Caves (about 30 minutes), add transfer time in between. I will be in Bermuda with my family for three days next week. Since our time is limited, I had not included a visit to the caves in our plans, but am now thinking it would be really great to try and fit in a tour on our way to the airport on our final morning. I am wondering what you recommend for the minimum amount of time to spend at the caves and whether we would be able to "store" our luggage/suitcases while on the tour. Thank you! Hi, you need to plan a minimum of about 45 minutes to 1 hour in the caves complex (to see both Crystal and Fantasy). You can keep your luggage at the airport, take a bus (#1 or 3) for the caves... it's a short ride, about 10 minutes. But don't try to carry any bags in the bus... it won't be allowed. 1) there is a luggage storage facility at the Visitors Information Center at St. George. That would mean taking your taxi further beyond airport for about 8-10 minutes, and then taking a bus or the same taxi to the caves. 2) better hire the taxi for 3 hours and keep the luggage in the boot. It would cost about $150 for 3 hours (@$50 an hour). However considering the airport transfer cost (which you would incur anyway) and the tour of the caves, it can be a nice package, and you can also be more efficient with timings. You can even add some more places to visit if time permits. Hi, Take bus #10 or 11 from Hamilton to Aquarium/zoo. Continue on the same route (#10 or 11) and get off at Blue Hole Hill circle (next to Bailey's Bay Ice Cream and near Swizzle Inn Pub). From there walk for 2 minutes to the entry of Crystal Caves road (where the caves bus stop is on Wilkinson Avenue. Note that it requires 3-4 minute walk from the Caves bus stop to reach the entry to caves). Come back to the Caves bus stop and take bus #1 or 3 to St. George. Alternatively walk back to Blue Hole Circle and take earlier bus route (#10 or 11) to St. George. 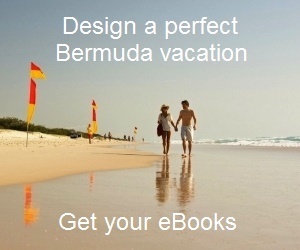 I am planning my itinerary for my vacation to Bermuda. I am a cruise passenger and planning to go to Crystal and Fantasy Cove then St George afterwards. Our ship will dock ETA 1:00 PM. I am planning to take the blue ferry route from King's Wharf to Hamilton (1:30 PM - 1:50 PM), then catch Bus #1 around 2:15 PM. So will bus #1 drop me close to Crystal and Fantasy Cove, and if not, how far do I need to walk going to the Cove? Also, after the tour, can I catch bus #1 or #3 going to St. George? Hope you can help me. Thanks in advance. Yes, bus #1 and 3 will drop you at Crystal & Fantasy Caves, and you can catch the same buses for St. George. I have tried to contact the management for the caves to make a booking but the email [email protected] keeps bouncing back. How can I make a reservation? I am cruising into Bermuda on celebrity Eclipse in November. The cruise ship appears to only offer a combination of the caves and the zoo. Don't want to go to the zoo. Look forward to hearing from you. You don't need to make a booking in advance to visit the caves. Just buy the entry ticket and get in. They offer a local guided tour of the caves. Hi, kids and babies are allowed in Crystal caves (no entry fee for kids under 5). You should hold your kid and not let him lose. It should be okay. Hi, You don't need to book a tour of Crystal caves through your cruise line or through any local operator. Just take the ferry to Hamilton and then take bus #1 or 3 to Crystal Caves. Once you buy the entry tickets, there is a guided tour available at the caves itself or you can be on your own. Thank you for your reply. Your site has been very helpful. You can take bus #1 or #3 from Hamilton City for the caves and return by the same buses. Both run every 30 minutes. Can we dive in the Crystal cave. If yes do I need a special course and what is the price. Diving is not allowed in Crystal caves. It requires special permission from the authorities for scientific exploration etc. The complex has two caves - Crystal and Fantasy. Both caves have 80+ steps plus a ramp. Fantasy is deeper and has 88 steps. However the steps in Crystal cave is more gradual while fantasy steps are steeper. Both caves have handrails and places to sit on the way down or up. So one can take it easy and negotiate the stairs at slow pace. You will need to climb back up the same way. However if one has serious knee problems, or other difficulties like claustrophobia or heart problems, then I would suggest not to take the caves tour. It does get a bit humid inside as you climb down. But otherwise, it's a great place to visit. Hello, I'm currently on a cruise ship in Kings Wharf (today and tomorrow) and only just learned about the Crystal/Fantasy Caves. I'd love to visit them during my time here and will try the ferry and buses you mentioned. What is the cost for the ferry and the bus? Can you also give me an approximate travel time to/from the caves by ferry and bus? Also, what would be a great but not too costly place to have lunch while I'm at the Caves and Kings Wharf? Any cultural foods I should try? I'm hoping to have as close to the 'native' experience as possible. Many thanks for your time and guidance. Hi Debby, Check out this link for Bus & Ferry Fares. From Kings wharf take a direct ferry to Hamilton City (20 minutes) or to St. George (35 minutes). From there take a bus to Crystal caves (around 25-30 minutes). There are several restaurants around. From the Crystal caves you can try the Swizzle Inn (Bermuda's oldest and famous pub. You will get standard pub fares though). Here are all the other Restaurants in Hamilton parish where Crystal Caves is located. I have discussed the restaurants at Kings Wharf in the following link: Kings Wharf Dockyard. Bermuda fish chowder, wahoo steaks, pawpaw casserole, Hoppin' John peas & rice are some of our favorites and will give you some local flavor in food. Have a great time in Bermuda! !